Isn't Jesus about relationship, not religion? Where did the Mass come from? Isn't a religious system man-made? What use is a hierarchical authority in a personal relationship to Jesus? "The Kingdom of God is a gift, and precisely because of this, it is great and beautiful, and constitutes the response to our hope. And we cannot - to use the classical expression - 'merit' Heaven through our works. Heaven is always more than we could merit, just as being loved is never something 'merited,' but always a gift." - Pope Benedict XVI (2005 - 2013), Spe Salvi, par. 35. Many evangelicals say that Jesus is about relationship not religion. To them, the word "religion" is almost despised, being associated with rituals, traditions of men and customs that don't appear to have any bearing on a relationship with Jesus whatsoever. They would say it's superfluous stuff that gets in between a person and his/her relationship with Jesus. Some even talk about a "spirit of religion" which can affect a person, perhaps even requiring deliverance. They may say that Christians in liturgical traditions have a "religious spirit", because the way these Christians worship looks so different from their own way of worshipping. We feel that Catholics who kneel in the pews and say the "Our Father" - the "ritual" part of our worship - with a sincere and engaged heart, are just as pleasing to the Father and Jesus as an evangelical who raises their hands during worship (which, by the way, is a ritual as well). This is totally cool with us - we raise our hands, so does our priest. "... we can do all the right outward things and yet our heart is far from it. God is looking for true worshippers... not just learned behaviour... We have to be very careful my charismatic friends that we don't just become like a bunch of parrots and learn a lot of charismatic words and ... sound so spiritual....It takes discipline to think about what you're singing...."
Indeed, engaging the head and the heart is a discipline. "If any one thinks he is religious, and does not bridle his tongue but deceives his heart, this man's religion is vain. Religion that is pure and undefiled before God and the Father is this, to visit the fatherless and widows in their affliction, and to keep himself unspotted..."
(Notice how this definition of religion has more to do with the state of one's heart and subsequent actions, and nothing to do with how a church service is held.) So we don't think religion is a bad word. However, it's often associated with rituals and prayers and posturing. Let's look at some of these areas. Some Evangelicals make fun of the Catholic Mass and call it the "smells and bells." But if we look at early Christians we see quite a similar ceremony. They were men of their time and culture. They were heirs to the style of worship which Christianity inherited, naturally and organically, from its Jewish origins. Moving forward in time, Justin Martyr (100 - 165 AD) wrote a number of apologetic works. His "First Apology" was addressed to the Roman Emperor Antoninus Pius as an explanation of Christian practices. Chapter 66, in particular, discusses the practice of the Eucharist and clearly lays out the early Church teaching that it is the Body and Blood of Christ. "And this food is called among us Eucharistia [the Eucharist]... so likewise have we been taught that the food which is blessed by the prayer of His word, and from which our blood and flesh by transmutation are nourished, is the flesh and blood of that Jesus who was made flesh..."
And this food is called among us ÃŽâ€¢Ã¡Â½ï¿½Ã�â€¡ÃŽÂ±Ã�ï¿½ÃŽÂ¹Ã�Æ’Ã�â€žÃŽÂ¯ÃŽÂ± [the Eucharist], of which no one is allowed to partake but the man who believes that the things which we teach are true, and who has been washed with the washing that is for the remission of sins, and unto regeneration, and who is so living as Christ has enjoined. For not as common bread and common drink do we receive these; but in like manner as Jesus Christ our Saviour , having been made flesh by the Word of God, had both flesh and blood for our salvation, so likewise have we been taught that the food which is blessed by the prayer of His word, and from which our blood and flesh by transmutation are nourished, is the flesh and blood of that Jesus who was made flesh. For the apostles, in the memoirs composed by them, which are called Gospels, have thus delivered unto us what was enjoined upon them; that Jesus took bread, and when He had given thanks, said, This do in remembrance of Me, Luke 22:19 this is My body; and that, after the same manner, having taken the cup and given thanks, He said, This is My blood; and gave it to them alone. Which the wicked devils have imitated in the mysteries of Mithras, commanding the same thing to be done. For, that bread and a cup of water are placed with certain incantations in the mystic rites of one who is being initiated, you either know or can learn. In Chapter 67, he provides information on the weekly Sunday meetings of the congregation, consisting of readings from the Jewish prophets and "the memoirs of the apostles", prayers, and a meal. This is the layout of the Catholic Mass. "And on the day called Sunday , all who live in cities or in the country gather together to one place, and the memoirs of the apostles or the writings of the prophets are read, as long as time permits; then, when the reader has ceased, the president verbally instructs, and exhorts to the imitation of these good things. Then we all rise together and pray, and, as we before said, when our prayer is ended, bread and wine and water are brought, and the president in like manner offers prayers and thanksgivings, according to his ability, and the people assent, saying Amen..."
And we afterwards continually remind each other of these things. And the wealthy among us help the needy ; and we always keep together; and for all things wherewith we are supplied, we bless the Maker of all through His Son Jesus Christ, and through the Holy Ghost. And on the day called Sunday, all who live in cities or in the country gather together to one place, and the memoirs of the apostles or the writings of the prophets are read, as long as time permits; then, when the reader has ceased, the president verbally instructs, and exhorts to the imitation of these good things. Then we all rise together and pray, and, as we before said, when our prayer is ended, bread and wine and water are brought, and the president in like manner offers prayers and thanksgivings, according to his ability, and the people assent, saying Amen; and there is a distribution to each, and a participation of that over which thanks have been given, and to those who are absent a portion is sent by the deacons. And they who are well to do, and willing, give what each thinks fit; and what is collected is deposited with the president, who succours the orphans and widows and those who, through sickness or any other cause, are in want, and those who are in bonds and the strangers sojourning among us, and in a word takes care of all who are in need. But Sunday is the day on which we all hold our common assembly, because it is the first day on which God, having wrought a change in the darkness and matter , made the world; and Jesus Christ our Saviour on the same day rose from the dead. For He was crucified on the day before that of Saturn (Saturday) ; and on the day after that of Saturn, which is the day of the Sun, having appeared to His apostles and disciples, He taught them these things, which we have submitted to you also for your consideration. In the first two centuries the Mass contained the two part formula we still use today. 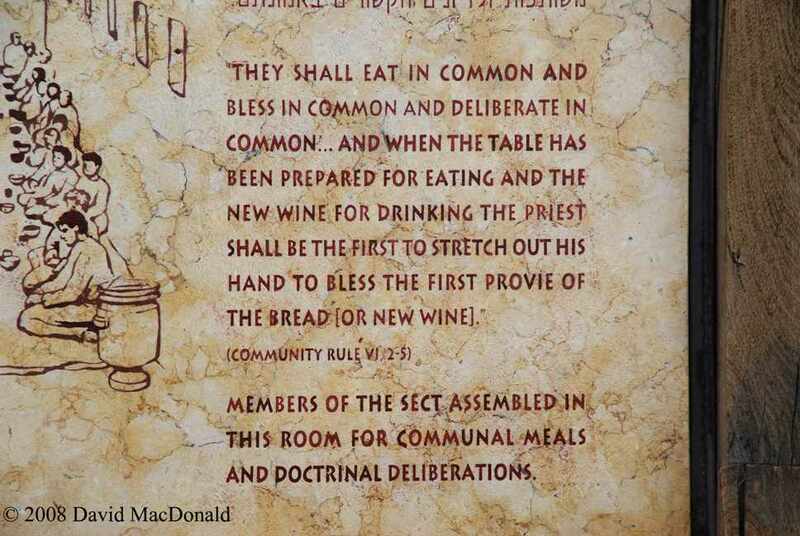 It began with teachings and readings from Scripture followed by the breaking of bread, and wine. The Word of God in writing was followed by the word of God made flesh. The Bible describes a gathering where they had teachings and readings 'til midnight followed by the breaking of bread. (Acts 20:7-12). Catholics don't think God is against the use of ritual as part of the way he ministers to his people. He is only against empty rituals that are performed with no heart behind them. From the commandments of the Lord, the Jews developed various rituals, which served as reminders for directing worshippers into the presence of God. Some of the symbols used in prayer were: the tefillin - two small wooden boxes wrapped in leather and filled with parchments of, the mezuah - more small scrolls of Scripture attached to the door frame of every house (see Deut. 6:9), the tzitzit-fringes attached to four-cornered garments that reminded the wearer to observe all the commandments (see Num. 15:37-41) and the tallit - the prayer shawl, which hosted the fringes during prayer (Hil. Tzitzit 3:11). These would all have been part of the customs that Jesus was used to. Before anyone rolls their eyes and says, "That's so religious," we must remember that it was God Himself who commanded that these rites be observed by His people. A legitimate question is: Why did God want these symbols? Rabbi Saul (later the apostle Paul) said that "the law was our tutor to bring us to Christ" (Gal. 3:24, NKJV). It appears that, in the very doing of the ritual, the Lord was trying to instill something about Himself. Obviously, He did not want these forms to become vain traditions. On the contrary, God wanted them done from the heart with passion. They go on to describe how Jesus would have joyfully participated in His bar mitzvah, donning the tefillin for the first time, binding the small leather box of scriptures on his arm, and the phylacteries on his body, all the while reciting prayers. He would then face the Temple Mount with arms raised, and feet together, praying the standard Eighteen Benedictions, all the while bending and bowing, but not allowing the prayer to become merely routine. Finally, after bolding declaring the Shema, He would carefully untie the tefillin, having spent at least 30 minutes in this "private service of the heart." Rituals and bodily posturing draw our hearts heavenward, but only if our hearts stay engaged. Otherwise, religiousity - an empty form of worship - can affect Christians across all denominations. There are numerous scriptural references warning about having only a form of godliness, or praising God with our mouth, but having our hearts far from him. Genuflecting: Catholics believe Jesus is truly present in the Tabernacle. If we ask an Evangelical what he would do if he saw Jesus standing in front of him he would say, "I would fall to my knees." Although a Bible Christian may disagree on the real presence of Jesus, he will certainly not disagree that bending to one's knees is an appropriate response to the real presence of Jesus. One Evangelical told Father Bob Bedard, "If i believed what you believed, that Jesus is really present in the Eucharist, I'd be at Church every day and I would fall to my knees when I entered." Ditto, I go to Church every day and fall to my knees when I enter. Our response is a silent prayer --a response to the declaration of the Gospel reading where the priest or deacon says: "A reading from the holy Gospel according to John." And the congregation, tracing the cross over their forehead, lips, and heart, is supposed to say to themselves (silently); "May the Words of the Gospel be on my mind, upon my lips, and in my heart." At the same time, of course, we vocally respond: "Glory to you, oh Lord." Tracing the little cross over our forehead is actually the original form of the Sign of the Cross ---the one used by the earliest Christians, before the Council of Nicaea. It is retracing where the bishop placed the oil (in the form of a cross) on your forehead at Confirmation. The present Sign of the Cross was developed around the time of Nicaea itself to deny the error of Arianism and express belief in the Trinity as the Council of Nicaea defined it. Kneeling: We love it when Evangelicals turn their chairs around, and facing the chair, kneel on the floor, resting their elbows on the chair. The first time I (Hugh) saw that at a conference of Evangelical pastors, I thought to myself, "it would be a lot easy for them to just get kneelers." Of course, I got down on my knees and prayed with everyone using these makeshift kneelers. I felt very much at home in this traditional Catholic prayer position. As Catholics we kneel a couple of times during the Mass, including during the prayer of consecration (for the Eucharist). Indeed, an appropriate posture when one is about to receive Our Lord and Master - Body, Blood, Soul and Divinity. Does the Catholic church hold to the "tradition of men"? The Bible addresses two types of "tradition". Mark 7:8 "For laying aside the commandment of God, you hold the tradition of men, [as] the washing of pots and cups: and many other such like things you do." 2 Thes. 2:15 "So then, brethren, stand firm and hold to the traditions which you were taught, whether by word of mouth or by letter." The way we worship in the Catholic Church is often misunderstood for the simple reason that the Church has held fast to the "Apostolic traditions" from the beginning. If the Church changed to accommodate every cultural upheaval that has occurred over the past 2000 years, we'd look like just another contemporary denomination which has its time and then fizzles away. The Church will continue to be faithful to Jesus' commands including to eat his flesh and drink his blood (Jn. 6:54-59), to keep his commandments (including the fifth one - thou shalt not kill - especially pertaining to abortion, euthanasia, IVF issues), to recognize the family (man-woman in marriage) as the building block of society (including issues around chastity and contraception), to resist the gay agenda, and to not allow women ordination to the priesthood (because Jesus didn't give the Church the authority to do that). The Church won't succumb to "traditions of men" that have cropped up in every generation for 2000 years. Here's more information regarding Traditions of men. The dictionary says religion is a "belief or a particular system of religious belief and worship." Perhaps the offending term to some Evangelicals is the word "system." They feel that any system of belief is man-made. Catholics think God is a God of order and therefore is capable of giving us a system of belief. Catholics believe God created the solar "system." God created the "eco-system." He created the human immune "system." Catholics don't think that God is afraid of organization and systemization. Catholics think this is how God is unfolding his plan that is laid out in his Holy Word, the Bible. Catholics think this "system" is how he guards against thousands of conflicting interpretations of Scripture. Another complaint against Catholicism is that it is a complicated system. Catholics don't think God is afraid of complex systems. If we watch a dragonfly, we'll soon see how awesomely complicated God is. A quick read through the book of Revelation will also spin our head around. God is wonderfully complex. The fact that the Church is a "complicated system" is not a testimony against it. Catholics believe the complexity is a testimony for being in favour of it. The eco-system is complicated and it is totally of God. (Gen 1:1). This complexity could be translated to, "rich in depth and width, time and space." The Catholic Church stretches across the entire world and reaches back to the time of Christ. Yet a Catholic's relationship with Jesus is intensely simple. This is a great paradox of Catholicism. For the lay person, the Catholic faith is easy to access: surrender and pray to Jesus, read the Bible, go to Mass, and follow the directions of the Church. Evangelicals would say, "pray to Jesus, read the Bible, meet with other Christians, and join a body of like-minded Christians." Evangelical book stores have thousands of books written about Jesus, the faith, relationships and every other topic under the sun. Some of the books are great, but some of them are in conflict with each other. In reading all these books we have trouble understanding the Evangelical claim that Catholics are too complicated. Some of the Evangelical stuff is just as "deep, heady, and complicated." The way we worship in the Catholic Church is radically different from most evangelical denominations due to the Liturgy that has existed since the early centuries of the Church. Some Evangelicals may observe Catholics and the way we worship and conclude that we have dead, rote prayers, and aren't being "led by the Spirit". While there certainly may be some Catholics who are not praying from the heart at any given time, we don't think this applies only to Catholics. Rather, this is true for Christians in any denomination. Many people in Evangelical churches raise their hands, speak in tongues or sing worship songs without an engaged heart. It is not the actions or prayers we do that dictate whether or not we are doing something by rote. It is the state of our heart as we do those actions. The good Catholics that we know love to genuflect because they are honouring the Real Presence of God who is present before them. When they make the Sign of the Cross they are joining with the early apostles who did this. When they say the "Our Father" they are praying the way Jesus instructed them to pray. When they kneel they are demonstrating their humility and need of a Saviour. "Jesus, I plead your blood over my sins and the sins of my nation. God, end abortion, and send revival to America." Catholics have similar, written-out prayers that been prayed by countless of faithful through the centuries. Authority and hierarchy are hard concepts to sell these days. Businesses are adopting horizontal organizational charts. Kids are swearing at their school teaches and beating them up. The public is pulling apart politicians. Perhaps these are all progressive ideas, but Catholics think this age has authority-phobia. I heard a sermon on the radio by a gifted Evangelical minister Dr. Tony Evans. He took us on a biblical tour or the hierarchical and structural authority in the heavens among the angels and heavenly creatures (Archangels, Cherubim, Seraphim, etc). He quoted the Bible chapter and verse to show that Angels only activate under authority, when they are told what to do by their superior. (Job, 38:7, Gen 3:24, 19, 21:17, 22:11, Acts 7:53, Ex 23:20-23, Judg 13, 6:11-24, Isa 6:5, 1 Kgs 19:5, Jude 1:9, Rev 12:7 etc.) I found Dr. Evans' had a powerful testimony to the Catholic approach to Church, although he perhaps didn't intend it. Dr. Evans showed that God is not at all afraid of structural authority. Angels have an intense personal relationship with God but they are totally into hierarchy. Catholics think the Hierarchical Structure of the Church was divinely inspired by God and revealed to those who formed it in the early centuries of Christianity. Another criticism of the Catholic faith is that it's too "intellectual" or "scholarly", and that there isn't more room for "the heart". However, when we think of the most influential "born- again" Christian in history, we have to question that position. The Apostle Paul was one of the greatest intellects in the history of mankind. Paul did not throw out his intellect after his encounter with Jesus. He used it. He went to Athens to dispute with the Greeks in Greek. He went to Rome and argued with the Romans in Latin as a Roman citizen. He always spoke with groups in the context of their socio/political framework. He used his intellect to win souls. He used his supreme knowledge of the law. We don't believe it was "all about the heart" for him. He used his powers of reasoning to convert pagans and to lay down the foundation of our Faith. The Catholic Church places value on the human reasoning that was given to us by God. God invented the intellect. Let's not throw theological scholarship away. The Pope made a famous speech about the relationship of faith and reason. It is here. What about all of the rules in the Catholic Church? aren't they man-made? To explore that question, we would have to separate dogma from "Canon Law." Dogma is the unchangeable doctrine. Canon Law are all the rules and regulations. They are not "infallible" and are subject to change. In that sense they are prayerfully "man-made." This is the fundamental principal of Church (Canon) Law. It is simply a bunch of rules that the Church has created in order to get on with the business of worshiping God. Every once in a while they are reviewed and revised. We do not think there is anything un-spiritual about creating rules so that things can function efficiently. Every Church denomination has them, which Ted Haggard found out the hard way. "Christian life can never be reduced to an oppressive set of rules which leave the soul in a state of exasperation and tension. Rather, it accommodates itself to individual circumstances as a glove fits the hand, and it says that, as well as praying and sacrificing ourselves constantly, we should never lose our supernatural outlook as we go about our everyday tasks, be they big or small." We believe dogma is fundamental to the Catholic faith. It is etched on the heart of the Church for eternity because the Church believes it was revealed by God and the Church declared it infallibly. An example of a dogma is the "Trinity" (Father, Son and Holy Ghost). The Church is very slow to define dogma. For instance, Christianity waited more than 300 years before we defined the Trinity, and Christianity waited 397 years before it decided on the books of the Bible. My experience in the Evangelical community is that most Churches have a "Mission Statement" or "Statement of Belief." Some people would say, "my Church is just about the Bible and Jesus and nothing else." That may be true until someone comes in and says they interpret the Bible in a way that conflicts with the rest of the people in the Church. In fact most Evangelicals I know have left a few Evangelical fellowships for that very reason. I encourage anyone who thinks their Church has no Mission Statement to ask their pastor. They may be surprised. Any Evangelical church (or brethren) that has a mission statement has, in a sense, accepted a system of belief - a religion. I expect if I asked them where the Mission Statement came from, they would say "God." So they are saying God gave them a system of belief and a plan to carry that belief into the world. That is religion. And that is what the Catholic Church has done under God's grace. It doesn't mean that there is no personal relationship with Jesus Christ. It is simply an action plan, revealed by God. Catholics who "get it" have an intense personal relationship with Jesus and hand their lives over to this King of kings. If we wanted to be in relationship with a great artist, we would not only spend time with him, we would also study some of the beautiful works of art he has done. Catholics believe Jesus is a great artist and one of his greatest works of art is the historical body of Christ - the Church. See also, "Are Catholics Born Again?" A fuller discussion of dogma is here.